This edited volume explores how primary school teachers create rich opportunities for science learning, higher order thinking and reasoning, and how the teaching of science in Australia, Germany and Taiwan is culturally framed. 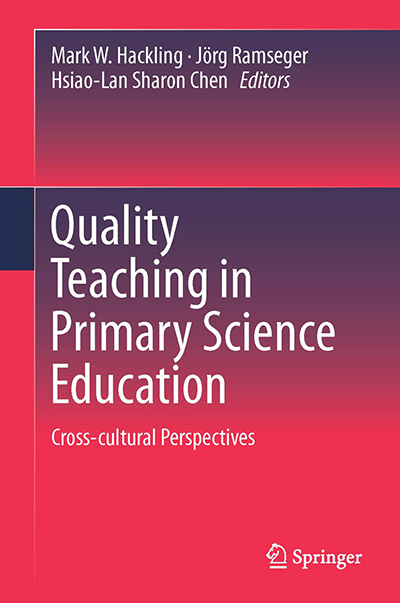 It draws from the international and cross-cultural science education study EQUALPRIME: Exploring quality primary education in different cultures: A cross-national study of teaching and learning in primary science classrooms. Video cases of Year 4 science teaching were gathered by research teams based at Edith Cowan University, Deakin University, the Freie Universität Berlin, the National Taiwan Normal University and the National Taipei University of Education. Meetings of these research teams over a five year period at which data were shared, analysed and interpreted have revealed significant new insights into the social and cultural framing of primary science teaching, the complexities of conducting cross-cultural video-based research studies, and the strategies and semiotic resources employed by teachers to engage students in reasoning and meaning making. The book’s purpose is to disseminate the new insights into quality science teaching and how it is framed in different cultures; methodological advancements in the field of video-based classroom research in cross-cultural settings; and, implications for practice, teacher education and research. “The chapters (of this book) address issues of contemporary relevance and theoretical significance: embodiment, discursive moves, the social unit of learning and instruction, inquiry, and reasoning through representations. Through all of these, the EQUALPRIME team manages to connect the multiple cultural perspectives that characterise this research study. The ‘meta-reflection’ chapters offer a different form of connection, linking cultural and theoretical perspectives on reasoning, quality teaching and video-based research methodologies. The final two chapters offer connective links to implications for practice in teacher education and in cross-cultural comparative research into teaching and learning. These multiple and extensive connections constitute one of the books most significant accomplishments. The EQUALPRIME project, as reported in this book, provides an important empirical base that must be considered by any system seeking to promote sophisticated science learning and instructional practices in primary school classrooms. By exploring the classroom realisation of aspirational science pedagogies, the EQUALPRIME project also speaks to those involved in teacher education and to teachers. I commend this book to the reader. It offers important insights, together with a model of effective, collegial, collaborative inter-cultural research. It will help us to move forward in important ways”. Chapter 1: An Overview of the EQUALPRIME Project, Its History and Research Design. By Jörg Ramseger and Gisela Romain. Chapter 2: Social and Cultural Factors Framing the Teaching and Learning of Primary Science in Australia, Germany and Taiwan. By Mark Hackling, Hsiao-Lan Sharon Chen and Gisela Romain. Chapter 3: Physical Learning Environments for Science Education: An Ethnographic Field Study of Primary Classrooms in Australia, Germany and Taiwan. By Peter Hubber and Jörg Ramseger. Chapter 4: Variation in Whole Class, Small Group and Individual Student Work Within and Across Cultures. By Mark Hackling, George Aranda and Ines Freitag-Amtmann. Chapter 5: Inquiry Teaching and Learning: Forms, Approaches, and Embedded Views Within and Across Cultures. By Hsiao-Lan Sharon Chen and Russell Tytler. Chapter 6: Teachers from Diverse Cultural Settings Orchestrating Classroom Discourse. By Russell Tytler, George Aranda and Ines Freitag-Amtmann. Chapter 7: Reasoning Through Representations. By Russell Tytler, Karen Murcia, Chao-Ti Hsiung and Jörg Ramseger. Chapter 8: Embodied Strategies in the Teaching and Learning of Science. By Khadeeja Ibrahim-Didi, Mark Hackling, Jörg Ramseger and Barbara Sherriff. Chapter 9: Reflections on Reasoning. By Russell Tytler. Chapter 10: Reflections on Quality Teaching in Primary Science Classrooms in Diverse Cultural Settings. By Gail Chittleborough, Jörg Ramseger, Chao-Ti Hsuing, Peter Hubber and Russell Tytler. Chapter 11: Reflections on Video-Based, Cross-Cultural Classroom Research Methodologies. Mark Hackling, Gisela Romain and George Aranda. Chapter 12: Implications for Practice and Teacher Education. By Russell Tytler, Jörg Ramseger, Peter Hubber and Ines Freitag-Amtmann. Chapter 13: Implications for Cross-Cultural Comparative Studies of Teaching and Learning. By Hsiao Lan Sharon Chen and Pei-Tseng Jenny Hsieh.